Please Note: All first-year clients are charge the one-time only plan set-up fee. The pricing above applies to the first year of service only. Renewal fees may be adjusted because no set-up fee is charged in subsequent years. Affordability, great investment flexibility and ease of use draw people to 401k Easy. Of these three attractions, affordability often plays the most influential role. A one-time Setup Fee, which covers customization of your retirement plan and the Gateways you and your employees will use to interact with it. The applicable Annual Fee, which is based upon your plan's size. We at Pension Systems Corporation, distributor of 401k Easy, has always worked hard to keep 401(k) plans as affordable as possible for our clients, many being small and very small companies. Our policy is not to accept any rebates or revenue sharing of fees deducted from our clients' plan assets ... period! Entities that provide 401k plans, including mutual funds managers, fund distributors, asset custodians, asset trustees, investment brokers and advisors, and plan administrators and record-keepers. These entities typically earn at least a portion of their compensation from asset-based fees extracted from plan assets; 401k Easy is an exception from the norm. 401k Easy is an exception to the norm in that we do not earn any compensation, either directly or indirectly, from our clients' 401(k) plan assets. If rebates are offered, we have the rebates returned to the client. Our published prices, available online for all to see, are the only compensation we collect. Today the typical American household saving for retirement in a 401(k) will pay nearly $155,000 in un-necessary, excessive, mostly hidden 401k fees and commissions to brokers, agents and administrators. Participants in our 401k Easy 401k plans are NEVER charged unnecessary marketing fees, including revenue-sharing fees, agent and broker commissions, or recordkeeping fees. Our 401k Easy plans being a clear exception, the vast majority of small 401k plans are larded with various "marketing fees" that 401k participants unknowingly pay. These unnecessary marketing fees include revenue-sharing fees, agent and broker commissions, and rebates to third-party administrators for pre-packaging mutual funds into the 401k plans. Demos.org, a well-regarded national non-profit research organization, calculates these unnecessary, non-essential marketing fees cost the typical 401k investor approximately $155,000 in lost value for the lifetime of his or her account! Most 401k savers are unaware they are paying unnecessary marketing fees and advisors commissions, extracted from their 401k accounts. 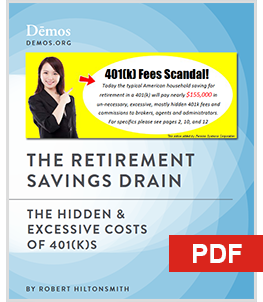 It's a national scandal --- and reduces the typical 401k value by nearly $155,000! 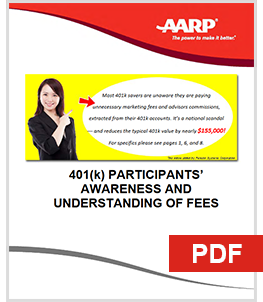 The vast majority of 401k participants in smaller plans are charged unnecessary Marketing Fees they do not know about or understand. According to a study of 401k fees by AARP (AARP.org), "When plan participants were asked whether they pay any fees for their 401(k) plan, eight in ten (83%) reported that they did not pay any fees." For example, a 30-year old who saves $250 a month in the 401k may be charged approximately $136,000 in unnecessary, non-essential Marketing Fees by age 65. For more examples of the losses caused by 401k Marketing Fees to various sample investors, please click here. 401k Easy (Standard) : $995 + [No "all-in" hidden and marketing fees -- EVER! = $995 per year complete! So it's not rocket science to understand why many plan providers in the 401k industry are blowing smoke to make any discussion about hidden or "all in" 401k fees confusing and bewildering. There is a great deal of money at stake, and all this smoke clouds the fact that many small employers are unknowingly offering their employees 401k plans laden with hidden fees. Hidden and "all-in" 401k fees are getting noticed by the news media and the legal profession via class-action law suits, and some 401k plan providers that made fortunes mining hidden fees are now scrambling to cover their tracks. They are generating the kind of PR confusion many of us remember from years past, when major tobacco companies tried to explain to Americans that smoking was not hazardous their health. Many in the 401k industry are launching the same kind of PR assault, confusing and clouding the issue, but what is really at stake is the end of their 401k hidden fee gravy train, pure and simple. As you can see above, the 401k Easy annual fee is based solely on the size of the employer, not the plan design options you select for your plan. This flexibility is not industry-standard - particularly regarding investment flexibility. Though we do charge a modest per-incident fee per 401k loan disbursement, distribution, QDRO, compliance test correction or hardship withdrawal. Apologies for the repetition. We simply want to be clear that the above annual fees really are all-inclusive. One of the great things about 401k Easy is its adaptability. Our IRS-approved prototype 401k plan includes a host of plan design options, which we detail below, and our online administration and participation systems - your Plan Sponsor Gateway and Plan Participant Gateway - contain further customization flexibility. The one-time set-up fee charged at your plan's outset pays for all customization. The fee is charged only one time at your plan's outset. If in subsequent years if you decide you want to alter your plan or system design choice, that's no problem. Our staff can help you understand the plan and system design options open to you, so you can make educated decisions as to which are most desirable for your company and the health of its 401k retirement plan. We code your decisions into the Plan Sponsor Gateway and Plan Participant Gateway that you and your employees will use to interact with your company 401k plan, empowering the system to streamline 401k management and participation and automate many of its functions. Plan administration via 401k Easy takes most small businesses less than 15 minutes a month - while saving them thousands of dollars a year. Visit our Order & Customization section to view the exact choices currently available under each of these plan design options. Future Changes - You are never locked into your 401k Easy plan and/or system design decisions. We have many clients that, for instance, exclude 401k loans in the early years of their plan, then add the option in at a later date. Know that you can have us modify your plan and system design at any time. We do reserve the right to charge for changes initiated by you that require us to re-customize your 401k online software and/or official 401k documents. The maximum charge for re-customization work is $500 per instance and depends upon the complexity of the changes required; in most cases, the charge is less than $200, if not waived completely. Under federal regulations, the one-time 401k Easy set-up fee may be refundable in the form of a federal tax credit. New 401k Easy plans qualify to receive this federally-mandated dollar-for-dollar refund, but there are some restrictions, so please consult your tax advisor before signing up for 401k Easy to make sure you qualify. 401k Easy plans are IRS-approved as employer-trusted, which means you never have to hire - and thus never have to pay - any 401k trustees. Trustee fees in other 401k plans can add up to hundreds of dollars a year. Trustee fees are yet another thing you save with 401k Easy. 401k Easy has no hidden fees. As explained above, the only fees we charge are (1) the one-time plan and system setup fee and (2) the annual fee (the one based upon plan size). The only other fees that we would charge are (1) a per incident charge for 401k loan disbursements, distributions, QDRO's, compliance testing corrections and hardship withdrawals, (2) a plan amendments fee (for changes to your chosen plan design options), and (3) a plan termination fee (for plans exiting 401k Easy). In the 401k arena, expense fee disclosure, whether to plan participants or plan sponsors, has been notoriously confusing and unclear. The impact of these confusing hidden fees on plan participants' retirement accounts can be very significant over time. As example, consider a hypothetical 401k investment such as a mutual fund, with deducted expense fees of 1.3 percent versus one with fees of just .3 percent. Applied to an initial 401k investment of $5,000, with regular annual investments of $5,000 returning 10 percent, and compounded over 15 years, the difference between the 'low-fee' investment and the 'high-fee' investment adds up to $15,398. That's a significant sum deducted from a participant's retirement savings. With 401k Easy there are never any "hidden fees" or asset-based fees to contend with, so expense disclosure is a breeze for plan sponsors. In fact, 401k Easy reports to plan participants directly, in their online account statements, that no hidden or other fees are charged. We keep our 401k plans as affordable as possible for our clients, many being small and very small companies. We do not accept any rebates or revenue sharing of fees deducted from our clients' plan assets unless those fees can be returned to the plan or used to offset plan expenses. Entities that provide and support 401k plan investments include mutual funds managers, fund distributors, asset custodians, asset trustees, investment brokers and advisors, and plan administrators and record-keepers. These entities typically earn at least a portion of their compensation from asset-based fees deducted from plan assets. 401k Easy is the exception to the norm. We do not earn any compensation, either directly or indirectly, from our clients' 401k plan assets. If rebates are offered, we have the rebates returned to the client or directly applied to reducing our clients' costs. Our published prices are the only net compensation we collect. We set-up a special website (www.401kfundslookup.com) to help explain and partially satisfy the 401k service provider fee and 401k investments fee disclosure requirements under ERISA 408(b)(2). The information in this special website assists plan participants in both understanding the impact fees have on their 401k, and making informed investment decisions. Plan conversions involve administrative work on our part before we can get your new 401k Easy up and running. Rarely is it necessary for us to charge a conversion fee, but if your current plan is extremely complicated, a nominal conversion fee will be described before any work begins. Your current 401k provider may charge plan termination fees, as it likely has some administrative expenses involved with closing down your existing plan. Contact your current plan provider to learn about any plan termination fees. You can view all the plan design options available with 401k Easy by scanning through our Conversion Plans Order Form. If you have specific questions, contact us or submit a Conversion Plan Order Form and mark "Unsure. Please contact..." as applicable. Submitting an order form is the most expedient way for us to serve you, even if all you want at the moment is answers to conversion-related questions, because the order form collects pertinent information we likely need to answer your questions. Submitting an order form IN NO WAY obligates you to actually placing an order - no money changes hands - but the form does gather the data we need to accurately answer your 401k-related questions. Oh, and of course we do NOT share your data with any party. 401k Easy comes with a 60-day money-back guarantee on everything but the one-time plan and software customization fee (and plan conversion fee, if any). Because the setup fee is non-refundable, we created a fully functioning demo version of our 401k system for people to try out before they order their actual 401k Easy plan. The online real-time demo is the real 401k Easy. We customized it to service a fictitious company's plan, and then provide access to all (which of course is not the case with an actual plan). Nearly every 401k administration feature is activated. The demo system let's prospective clients try self-service online administration and participation on for size before spending any money. Our goal at 401k Easy is to ensure that all our clients and their employees have 401k plans they feel good about. If your company purchases 401k Easy and then down the road decides the self-service administrative approach is not the right approach for you, give us a call: We can convert your 401k Easy plan into a traditional, full-service plan that will still allow for 24/7 online access for plan participation but with professionals handing the plan administration for you. The US Department of Labor created a worksheet to assist consumers in comparing 401k providers. We have filled in information regarding 401k Easy. If you would like to fill-in information regarding additional 401k products, print the PDF version.